This is an excerpt from Coaching Youth Track & Field by American Sport Education Program (ASEP). The most common short relay in which nonvisual handoffs are used is the 43100-meter relay. Since the track is 400 meters, each athlete runs one-fourth of the oval. Typically, the athlete running the first leg carries the baton in the right hand and passes to the second runner’s left hand. The second runner passes to the third runner’s right hand, and the anchor runner brings the baton home in the left hand. This right, left, right, left pattern allows the first and third runners, who will be running on the curves, to hug the inside of the lane and pass the baton to the next runner (who will be running a straight) with the baton safely in the middle of the lane. Although this pattern is common practice, it is certainly not mandatory. 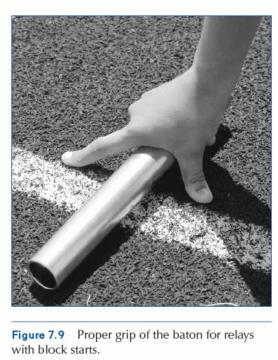 Coaches may decide to allow children to pass and receive the baton in their dominant hand or use any other combination that is best suited for their group of athletes. Nonvisual exchanges are used for shorter events that are run at full speed. In these events, many youth teams will use a block start for the first leg. In a relay, the mechanics and technique used for a block start are the same as in other sprinting events. The one difference is that the athlete must hold the baton. All parts of the athlete’s hands must be behind the starting line, but the baton may extend beyond the line. The baton is held at one end with the pinky, ring, and middle fingers holding the baton against the palm of the hand (see figure 7.9). The thumb and index fingers form a bridge to support the upper body. For athletes who are too small to hold the baton with this grip while in the blocks, an upright starting position is advisable. At the starting command, the first runner accelerates to full speed and races toward the first exchange zone. Incoming runners must work hard to avoid dramatic changes in speed late in their leg. As they approach the zone, they need to stay in their predetermined part of the lane (inside for legs 1 and 3, outside for legs 2 and 4) and aggressively attack the zone. In the nonvisual exchange, it is the responsibility of the incoming runner to place the baton in the hand of the outgoing runner. Outgoing runners position themselves in a stance that will allow acceleration and will allow them to see the incoming runner approach. These positions may vary. Some runners might want to get into a modified three-point stance to simulate the block start. Although this start may be faster, it is not recommended because the athlete will have difficulty seeing the go-mark from such a low position. A fundamentally sound stance would have the athlete slightly crouched with the feet mostly facing forward and the upper body slightly twisted in toward the incoming runner (see figure 7.10). The arms should be set in position to begin the alternate driving arm action characteristic of acceleration mechanics. As the incoming runner hits the go-mark (see the following section), the outgoing runner turns forward and begins accelerating. At the predetermined point, the outgoing runner moves the receiving hand into position and leaves it there—keeping it as still as possible—until he has received the baton. The outgoing runner must avoid “fishing for the stick” and should keep the hand steady. The incoming runner can see the hand, and it is this runner’s job to put the stick in the right place. In USATF competition, races that involve a nonvisual exchange allow outgoing runners some space to accelerate before they enter the exchange zone. (This is not permitted in Hershey’s program.) The acceleration zone is known as the fly zone or international zone. Athletes are allowed to set a “go-mark” on the track (outside the international zone) to indicate when they should begin running. When the incoming runner hits that mark, it is time to GO! To make the go-mark, athletes are allowed to use two pieces of athletic tape. The go-mark can be as small as a few inches of tape, or it could be as big as two pieces of tape stretched all the way across the lane. The latter might be good for young children who are just learning the event (although you will go through a lot of tape!). This bigger mark is called a box. It is easier to see when an incoming runner enters the box than when a runner passes a small piece of tape on the track. Establishing the proper position for the go-mark, however, takes a good deal of trial and error. When working on the exchange, both runners must go full speed rather than trying to adjust to make the pass. If they go full speed and miss the pass, the go-mark can be moved back or forward to adjust, and the runners can try again. If the runners are constantly adjusting speed, establishing a go-mark for full-speed running will be very difficult. To begin establishing the position for the go-mark, try the following suggestions. If the incoming runner is faster than the outgoing runner, make the mark farther back. If the outgoing runner is faster, make the mark closer. Outgoing runners can start anywhere in between the beginning of the fly zone and the end of the exchange zone. The goal is to start at a place that allows the runner to get close to full speed before receiving the baton. For young children, this usually means starting in the middle of the fly zone, while older children and adolescents often start near the beginning of the fly zone. In other words, the bigger and faster the athlete, the more of the acceleration zone they will use. Three styles of passes are commonly used in nonvisual exchanges: underhand, overhand, and push. The outgoing runner holds the receiving hand in a position very similar to the bridge formed in the starting blocks (see figure 7.11). The hand is held still, slightly behind the hip. The incoming runner uses an upsweep motion to place the baton in the hand. For an overhand exchange, the outgoing runner holds the receiving hand back with the palm facing up (see figure 7.12). The arm is straight and held higher than the hip. The incoming runner uses a downsweep motion to place the baton in the runner’s hand. For a push exchange, the outgoing runner holds the receiving hand at shoulder height with the thumb down, the palm facing the incoming runner, and the fingers pointing to the inside of the track. The incoming runner holds the baton straight up and down and pushes the baton into the hand. Runners who have practiced together for some time begin to get a sense of where the baton will be exchanged in the zone. At this point, the outgoing runner puts the receiving hand in position and the pass is made without a verbal command. More frequently, however, a command such as “stick” or “hand” is used to indicate when the outgoing runner is to put the hand in position. The incoming runner needs to make the command just before presenting the baton. A common mistake is initiating the passing action and then yelling the command. The outgoing runner then has to process the message and put the receiving hand back. This leaves the incoming runner running for a step or two with the baton extended. Learn more about Coaching Youth Track & Field.